Mom, the Intern: Adventures with the SWAT team. Adventures with the SWAT team. Sorry, this post is a little late, I know. But trust me, the story is worth it. So, last Tuesday around 3 p.m., Smush woke up from his nap and wanted to eat. He always eats during the 3:00 hour, the same time Oprah is on. So I sit on my bed, turn on Oprah and feed the baby. It's a daily ritual. So there I was, sitting on the bed, watching Oprah. It was the episode where she interviewed that crazy Octomom lady. I'm watching intently, trying to wrap my brain around having 36 kids or however many she has, when I hear a male voice outside. Shouting. Something about, "Police", "immediately" and "hands up." I thought maybe it was part of the Octomom craziness, but then I heard it again. So I put Smush down and went to my bedroom window, which is on the side of my house. We live on the corner, so a street runs along the side of my house where my bedroom is located. The freakin' SWAT team, lined up in formation at the door with their guns drawn, ready to go in. "This is the Mesa Police. All occupants at (address) must immediately vacate the home. Come out slowly with your hands up. We WILL use force if needed!" As you can see by the pictures, the front of the home in question faces the street that runs alongside my house. They are directly behind us, but our homes are not separated by a fence, so they really feel like our next-door neighbors. Which means I was really, really freaked out. I ducked down below the window and said, "Bubby! GET IN HERE NOW!" She was on the computer, watching Mickey Mouse Clubhouse. I crawled to the other side of the room and grabbed the phone. I called ... my mom. "MOM! THE SWAT team is outside my house! They have their guns drawn and everything?" "Nothing! It's my neighbor, the guy directly behind me!" We talked for a little bit, then I let her listen to the police shouting at the occupants over the intercom. I watched two men come out slowly, walking backwards with their hands up. They were cuffed and taken to the curb. The police gave whoever else was in there another chance to come out, and then they sent the SWAT guys in. It was seriously crazy. I felt like I was watching a movie. Only it was real and it was in my backyard. Then, they brought in a K-9 and let him sniff out the place. I heard him howling like crazy. My mom heard him over the phone. She suggested I call my husband. Well, that's probably a good idea. But first, I had to call KPHO. The news station I used to work for as an intern. If anything was going on, they'd certainly know. They had no idea, but they were certainly excited. The assignment desk lady told me to call back in 20 minutes and they'd try to figure it out. In the meantime, my eyes were welded to the window. My heart was pounding. Those bullets could easily blaze through my walls at any moment. I'd have been a goner. Eventually, the SWAT team came out, looking rather carefree and jovial. So, it was obviously nothing. I watched them jump into the vehicle and drive away. Guess that was the end of it. I decided at that point it was safe to go outside to talk to the officers who were still on the scene. See what the heck happened. Well, I opened my door and to my surprise, there was one of the detainees, gettin' put into the back of a patrol car. Like, 10 feet from my doorstep. I then called KPHO back and they told me it was just a search warrant for an aggravated assault case. 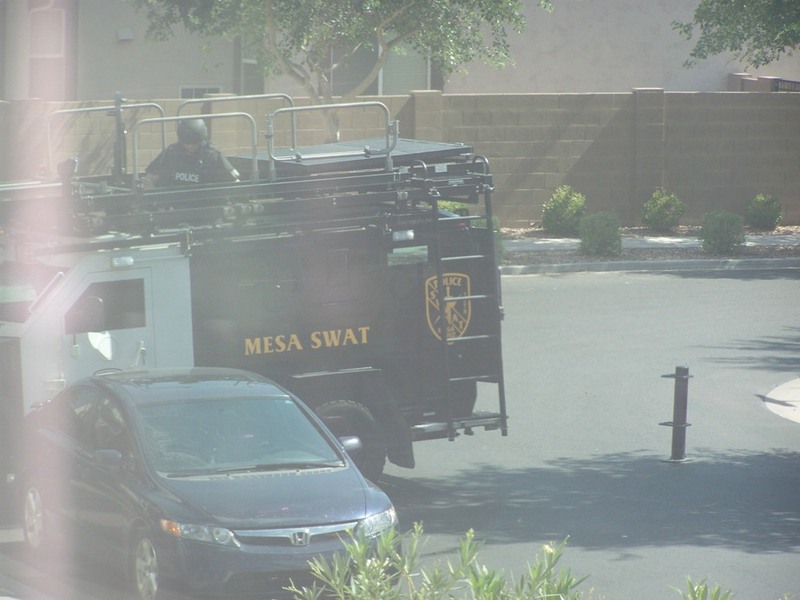 Mesa Police are now using SWAT for all search warrants. Seems a little excessive. Could have been a murder, for all I knew. Disclaimer: Usage of the SWAT team does not necessarily mean it's serious. But it COULD be. So, you probably shouldn't be snapping pictures like a crazed papparazzo. That's all. Glad they didn't have to open fire. But yeah that does seem excessive. 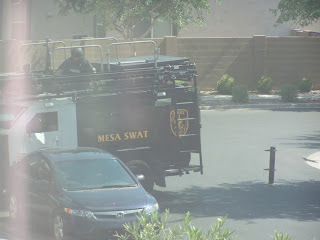 Last year the SWAT team came for a guy living in the house behind us (coincidentally where we used to live). He was hiding out and wanted for some drug charges. There were guys with guns drawn and search dogs going through are yard and garage. The finally used a flag grenade to get the guy out. It woke up the whole neighborhood at 11 pm. I was just glad my husband was home or I would have been way more shaken up than I already was. I'm glad you and the kiddie were safe, and that they got the guys they were after! Hope you are spared from any similar action in your neighborhood. Yeah, seems a little excessive to me too, but maybe they were bored? LOL Ahhhh, that story brings back so many childhood memories of laying on the floor in my Brooklyn apartment while shots rang out. My parents did drills for us too. Summertime was the worst... we slept many a night on the floor with our parents practically on top of us. Glad you guys were safe!